Discussion in 'In The News' started by PushSend, Apr 27, 2011. Below, other findings from the report, 11 Key Marketing Trends for 2011; Highlights from the Annual Marketing Survey, by Unica (an IBM company). * 44% of marketers are using mobile apps and another 31% plan to do so in the next 12 months. 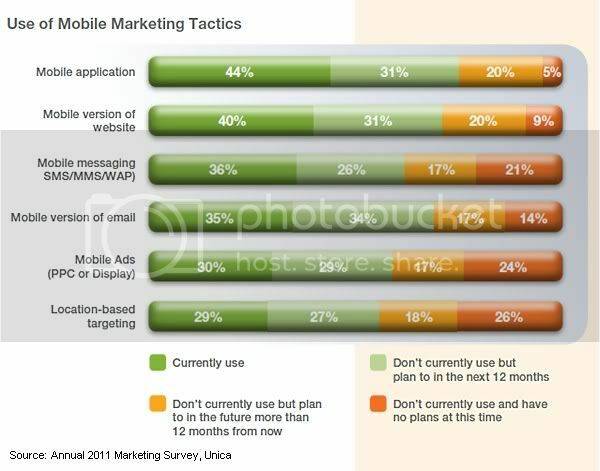 * 40% of marketers have mobile versions of websites, and 31% plan to implement one in the next 12 months. Roughly one-third of marketers (35%) are now optimizing email campaigns for mobile delivery and another third (34%) plan to do so over the next 12 months. Looking for great digital marketing data? MarketingProfs reviewed hundreds of research sources to create our most recent Digital Marketing Factbook (May 2010), a 296-page compilation of data and 254 charts, covering email marketing, social media, search engine marketing, e-commerce, and mobile marketing. Also check out The State of Social Media Marketing, a 240-page original research report from MarketingProfs. More than one-half of marketers (53%) say they now use social media marketing and another 24% plan to do so over the next 12 months. Another 10% of marketers say they have long-term plans to adopt social marketing (more than 12 months in the future) and 11% are still uninterested in social. * Websites: 57% now implement inbound-channel communications via Web and another 25% plan to do so in within the year. * Customer service/call centers: 52% now using and 18% have plans to do so within the year. 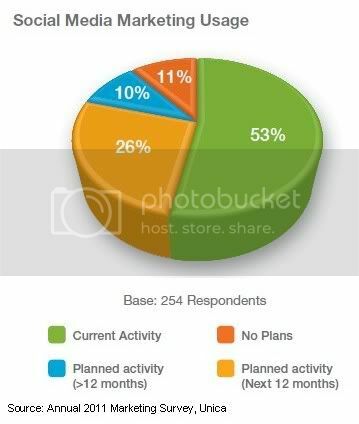 * Point-of-sale/kiosk/ATM: 28% now using and 21% have plans to do so within the year. * Nearly 90% say they're interested in an integrated marketing suite, while one-half say they are now integrating across some channels. * 57% say their top bottleneck is measurement, analysis, and learning. * 53% say they have an issue attributing success to marketing. * More than one-half cite technology as the key to productivity, in particular, to resolving the challenges of meaningful measurement and analysis, and to choosing the next best course of action.